As promoters go, Bill Graham was one of the best. He seemed to have the uncanny knack of spotting bands on their way up. Often he managed to book bands just before they made it big. This meant when a band were enjoying a hit single or album, they were playing at the Fillmore East or West. However, one band Bill Graham didn’t initially “get,” were Sly and The Family Stone. For whatever reason, Bill Graham didn’t see what other people saw in Sly and The Family Stone. Initially he wasn’t won over by their unique brand of dance music. As a result, he was reluctant to book Sly Stone and his band. Eventually, though, Bill Graham was persuade to go and see Sly and The Family Stone live. This changed his mind. Sly and The Family Stone in full flight were a musical powerhouse. Their fusion of soul, funk and psychedelia was winning friends and influencing people. They certainly won over Bill Graham. So much so, that Bill Graham booked Sly and The Family Stone to open for Eric Burdon and The Animals at four concerts a the Fillmore East in October 1968. These four concerts were recorded, but never released. That’s until recently. Live At The Fillmore East-October 4th and 5th 1968 was recently released by Sony Music as a four disc box set. Each disc features one of the concerts. They’re a fascinating insight into Sly and The Family Stone. Live At The Fillmore East-October 4th and 5th 1968 features Sly and The Family Stone way before they became one of the biggest bands of the late sixties and early seventies. Back then, they had only released a trio of albums, 1967s A Whole New Thing, 1968s Dance To The Music and Life. None of these albums were a huge success. That was still to come. By 1968, Sly and The Family Stone had only been together a year. Sly and The Family Stone was formed when Sly Stone and his brother Freddie decided to amalgamate their two bands, Sly and the Stoners and Freddie and the Stone Souls. The result was Sly and The Family Stone, the first multiracial band of the sixties. Originally, Sly and The Family Stone featured guitarist Sly Stone, guitarist Freddie Stone, drummer Gregg Errico, trumpeter Cynthia Robinson and saxophonist Jerry Martini. This was the initial lineup of Sly and The Family Stone. However, initially, there was a problem. Both Sly and Freddie were guitarists. Sly felt the new band didn’t need two guitarists. So, he volunteered to switch to the organ. There was one problem with this. He couldn’t play the organ. This didn’t bother Sly, who liked a challenge. Before long, Sly Stone was equally comfortable on guitar or organ. Now all Sly and The Family Stone needed, was a bassist. That was the missing piece in the musical jigsaw. Luckily, Sly Stone knew the very man, Larry Graham. So Sly went to see Larry Graham, and by the time he left, Sly and The Family Stone’s lineup was complete. Or so he thought. Then Sly Stone met Vaetta Stewart. She wanted to join Sly and The Family Stone. Vaetta Stewart was already a member of a gospel group, The Heavenly Tones with Mary McCreary and Elva Mouton. Once Sly Stone heard The Heavenly Tones, he decided to bring them onboard. They became Sly and The Family Stone’s backing singers, Little Sister. Now Sly and The Family Stone were ready to make some funky, soulful and psychedelic music. Soon, Sly and The Family Stone were playing local clubs. This allowed them to hone their sound. Some members of the two bands that became Sly and The Family Stone had never played together. However, it didn’t take long before the new band were firing on all cylinders. Quickly, Sly and The Family Stone established a name for themselves in San Francisco. One night they were booked to play at the Winchester Cathedral, nightclub in Redwood City. Sly and The Family Stone approached the concert like any other. Little did they realise that out front, sat David Kapralik from CBS Records. After the concert, David Kapralik approached Sly and The Family Stone. He had liked what he heard, and wanted to sign Sly and The Family Stone to CBS Records’ imprint, Epic Records. For such a new band, this was almost unheard of. However, Sly and The Family Stone didn’t need to be asked twice. They signed on the dotted line. With Sly and The Family Stone now signed to Epic Records, work began on their debut album. Sly Stone was already proving to be the group’s creative force. He wrote the twelve songs that became A Whole New Thing and produced the album. However, Sly Stone way of working was quite different from other producers. Rather than employ overdubbing, Sly Stone decided to record A Whole New Thing live in the studio. To him, this made sense. It was how Sly and The Family Stone sounded live. There was also a sense of spontaneity and energy recording A Whole New Thing live. Doing things this way, was also quicker. So, A Whole New Thing was ready for release in October 1967. On the release of A Whole New Thing, critics gave Sly and The Family Stone’s debut album mixed reviews. However, within the music industry, A Whole New Thing found favour with Tony Bennett and Mose Allison. They were won over by Sly and The Family Stone and their groundbreaking fusion of funk, soul and R&B on A Whole New Thing. However, what did record buyers think? When A Whole New Thing was released, it didn’t sell well. It failed to even reach the lower reaches of the charts. For Sly and The Family Stone, this was a disaster. They had hoped that A Whole New Thing was their ticket out of the small clubs that they had been playing. That wasn’t going to be the case. At CBS Records, the low sales of A Whole New Thing were a cause for concern. The label had high hopes for Sly and The Family Stone. So, president Clive Davis went to speak to Sly Stone. He explained to Sly that maybe, the followup to A Whole New Thing needed to be a much more commercial album. With Clive Davis’ advice ringing in his ears, Sly Stone set about writing a commercial song for him. He came up with Dance To The Music. It was recorded in late 1967, and released as a single in January 1968. Soon, Clive Davis had his single. Before long, Dance To The Music was climbing the charts. It eventually reached number eight on the US Billboard 100 and number nine on the US R&B charts. Across the Atlantic, Dance To The Music reached number seven in Britain. However, there was a problem. None of the members of Sly and The Family Stone like Dance To The Music. Although Dance To The Music was a fusion of funk, soul, R&B and pop, it had a much more poppy, commercial sound than the music on A Whole New Thing. While Dance To The Music had given Sly and The Family Stone a hit single, it wasn’t on their terms. The members of Sly and The Family Stone didn’t want to be in a pop band. Jerry Martini was the most vocal member of the band. He called Dance To The Music: “glorified Motown beats.” He wouldn’t be pleased when CBS Records wanted an album to followup Dance To The Music. When the recording of Sly and The Family Stone’s sophomore album began, a new member had joined the band. Rose Stone, Sly and Freddie’s sister had been recruited to play keyboards and sing backing vocals. With their newest recruit, Sly and The Family Stone got to work. Again, Sly Stone had penned each of the ten tracks. He also produced what became Dance To The Music, which featured several themes. This included peace, equality and brotherly love. Sly was keen to promote the message of equality, at a time when racism was rife. His platform to do so, was his music. It gave him the opportunity to reach a much wider audience than many activists. That was, if Dance To The Music sold well? Before the release of Dance To The Music, critics had their say. Most of the reviews were positive, with critics enthusing over this Sly and The Family Stone’s new sound on Dance To The Music. This they referred to as psychedelic soul. With such positive reviews of Dance To The Music, things were looking good for Sly and The Family Stone. Dance To The Music was released on April 27th 1968. Soon, it was climbing the charts. Eventually, it peaked at number 142 in the US Billboard 200 and number eleven in the US R&B charts. Clive Davis it seemed, had been right. By changing their style, commercial success came Sly and The Family Stone’s way. The only problem was, Sly and The Family Stone hated Dance To The Music. To them, it was tantamount to selling out. Ironically, numerous producers, including those toiling at the Motown music factory, took to copying Sly and The Family Stone’s new style. This new style would become their old style later in 1968. Following the success of Dance To The Music, Sly and The Family Stone returned to the studio in the summer of 1968. Recording took place in San Francisco, where Sly and The Family Stone recorded ten tracks penned by Sly Stone. Just like the two previous albums, Sly wrote the songs on Life, and produced the album. Unlike last time, Sly wasn’t going to have the band record an album they hated. Instead, he was a man with a plan, a master-plan. Sly Stone had decided there was no way he was recording Dance To The Music II. That wasn’t going to happen. So he decided to find a middle ground, somewhere between A Whole New Thing and Dance To The Music. This he hoped would result in an album that allowed Sly and The Family Stone to express themselves but sold well. M’Lady, Fun and Love City he hoped would appeal to those who enjoyed Sly and The Family Stone’s much more commercial sound. Other tracks, had a much more gritty sound. Just like previous albums, several themes run through Life. Among them are unity and integration. There’s also songs about groupies, plastic people and the dating scene. All these themes were explored on Life, Sly and The Family Stone’s second album of 1968. In September 1968, Life, Sly and The Family Stone’s third album was released. Mostly, reviews of Life were positive. There were the occasional unfavourable review. However, it seemed like Sly and The Family Stone had done it again, with their unique brand of funk and psychedelic soul. Success looked almost assured. That proved not to be the case. When Life was released, it didn’t sell well, and peaked at 195 in the US Billboard 200. It was a case of third time unlucky for Sly and The Family Stone. However, things were about to get a lot worse. Sly and The Family Stone were schedule to tour Britain. So, Sly and The Family Stone embarked on a transatlantic flight. Once they arrived in Britain, the tour began. At first, things were going to plan. Then Larry Graham was arrested for possession of marijuana. That wasn’t the end of Sly and The Family Stone’s problems. There were problems with British concert promoters. Eventually, Sly and The Family Stone decided to cut their losses, and return home. By the time they arrived on American soil, Sly and The Family Stone weren’t in a good place. To make matters worse, Sly and The Family Stone were about to make their Fillmore East debut. Following the problems that beset Sly and The Family Stone’s British tour, the band had to get their game head on. They were about to make their Fillmore East debut, this didn’t bode well for the 4th and 5th October 1968. Each day, Sly and The Family Stone would open for Eric Burdon and The Animals in their early and late shows. These four shows could play an important part in Sly and The Family Stone’s future career. Live At The Fillmore East-October 4th and 5th 1968. By the time, the 4th of October 1968 came round, Sly and The Family Stone were doubly determined that their four concerts at the Fillmore east would transform their ailing fortunes. So on the 4th October 1968, Sly and The Family Stone took to the stage for the early show at the early show at The Fillmore East. They proceeded to work their way through seven tracks, comprising cover versions and album tracks. From the moment Sly and The Stone strike up Are You Ready, they’re in the funkiest of grooves. They work their way through Colour Me True, Won’t, Be Long, We Love All (Freedom) and a medley of Turn Me Loose, I Can’t Turn You Loose. By then, Sly and The Family Stone have won over the Fillmore East. While they were just the support band, they were more than making an impression. Closing the show, were two tracks from Life, Chicken and Love City. As Sly and The Family Stone walked of the stage of The Fillmore East, it was to a standing ovation. Later, they had it all to do again. When Sly and The Family Stone opened their late show, it was with two different tracks. M’Lady from Life opened the show, before they turned their attention to Don’t Burn Baby from Dance To The Music. Then Sly and The Family return to Colour Me True and Won’t, Be Long. From there, they drop in St. James Infirmary, which was already a staple of Sly and The Family’s live show. Somehow, Sly and The Family were matching, and sometimes, surpassing the quality of the early show. They were on a mission. It was the perfect time to drop in their medley of Turn Me Loose, I Can’t Turn You Loose, and then Dance To The Music. By now, everyone in The Fillmore East seems to be on their feet. Now that Sly and The Family Stone have them where they want them, they close the show with Music Love and finally, a medley of Life and Music Lover. They then take their leave, and ready themselves to do it all again on the 5th October 1968. Having conquered The Fillmore East on the 4th October 1968, Sly and The Family Stone had it all to do again. Given they had produced two barnstorming performances, Sly and The Family Stone must have had mixed feelings. Could they top their two previous performances? They were going to give it a good go. As Sly and The Family Stone took to the stage, they opened with Life, the title-track to their third album. From there, they followed up with Colour Me True and Won’t Be Long. They had featured in the two previous sets, and allowed Sly and The Family Stone to their stride. Then came Dance To The Music, which was by then Sly and The Family Stone’s theme tune. Each set they were forced to play a song they loathed. However, this doesn’t show, as Sly and The Family Stone combine elements of funk, pop, psychedelic soul, R&B and even rock. They prove a talented and versatile band, one who seamlessly combine musical genres. This they do on Music and then, M’Lady a track from Life which closes the set. As Sly and The Family Stone make their way off the stage, they’re given another standing ovation. All they had to do, was do it all again that night. Unlike many bands, Sly and The Family Stone didn’t play the same set each time they took to the stage. Instead, they mixed things up. On the evening of the 5th October 1968, they opened with Life and M’Lady, before turning to Are You Ready, Won’t Be Long and Colour Me True. Having worked the audience into a frenzy with their unique brand of funky, psychedelic soul, Sly and The Family Stone drop in their biggest hit Dance To The Music. This has the desired effect, and almost lifts the roof off. From there, Music City gives way to Love City and the medley of Turn Me Loose, I Can’t Turn You Loose. Closing the show and two days at The Fillmore East is The Riffs. With that, Sly and The Family take their leave. Their luck has changed, and would continue to do so. Reviews of Sly and The Family Stone’s at The Fillmore East went a long way to restoring their reputation. The commercial failure of Life, then the ill-fated tour of Britain left Sly and The Family Stone’s reputation in tatters. 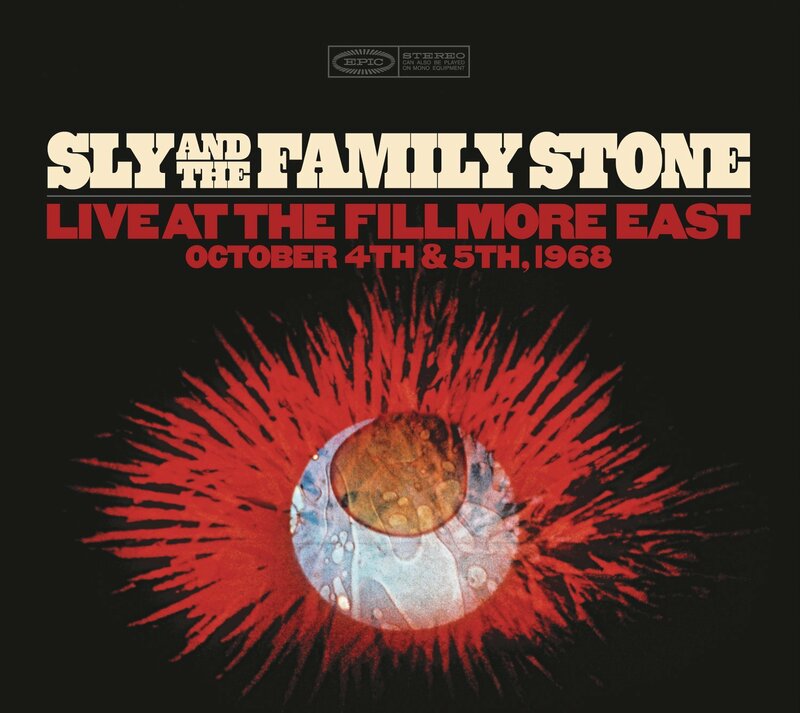 These two days at The Fillmore East were make or break for Sly and The Family Stone. If they hadn’t gone well, it could’ve been game over for Sly and The Family Stone. Would CBS Records have allowed Sly Stone the freedom to make Sly and The Family Stone’s next album Stand? It was the start of a five year period when Sly and The Family Stone could do no wrong. Maybe, Clive Davis would have parachuted a producer in to oversee Sly and The Family Stone’s fourth album. That wasn’t the case. Sly and The Family Stone were the conquering heroes, who had produced four barnstorming performances at The Fillmore East. They’re documented on Live At The Fillmore East-October 4th and 5th 1968, which was recently released by Sony Music. It features Sly and The Family Stone as they embark upon the most successful period of their career. This began when Sly and The Family Stone released Everyday People in December 1968. It reached number one on the US Billboard 100 and US R&B charts. Then on May 3rd 1969, Sly and The Family Stone released Stand. It reached number thirteen in the US Billboard 200 and number three on the US R&B charts. This resulted in Sly and The Family Stone’s first platinum album, and the beginning of the rise and rise of Sly and The Family Stone. Following Stand, Sly and The Family Stone were one of the stars of Woodstock. Their early morning set on 17th August 1969, was one of the highlights of Woodstock. This further cemented their huge popularity. After Woodstock, CBS, their record company were desperate for a new album. No wonder. Sly and The Family Stone’s profile was at an all time high. Deadlines were set, and deadlines missed. For CBS, this was frustrating. They were desperate for a new album. Realising a new album wasn’t going to be imminent, a Greatest Hits album was released in 1970. Featuring three new songs, Greatest Hits reached number two in the US Billboard and number one in the US R&B Charts. This resulted in Greatest Hits being certified gold. Eventually, Greatest Hits surpassed the success of Stand, selling five million copies and was certified platinum five times over in 2003. By releasing their Greatest Hits album, Sly and The Family Stone had bought some time. All wasn’t well within Stand, Sly and The Family Stone. At this time, relationships within the band were at an all time low, especially among The Stone brothers Sly and Freddie, and bassist Larry Graham. Tense doesn’t come close to describe their relationship. Ironically, Larry’s bass playing would be crucial to the success of what became There’s A Riot Goin’ On. It provided the heartbeat to the album. Sadly, the tension between the band members wasn’t the only problem surrounding Sly and The Family Stone. The other problem was that drug use was rife within the band. Stories emerged that Sly Stone allegedly, carried a violin case full of drugs everywhere the band went. Drug use had worsened when the band had relocated to California. PCP and cocaine were now the drugs of choice for the band. This started to affect the recoding schedule and tours. Sly’s moods changed One minute he was upbeat and happy, then suddenly he was moody. His behavior started to become erratic. Between concerts, it was reported that he spent much of his time taking drugs. For a band who’d just enjoyed two hugely successful albums, Sly and The Family Stone were shooting themselves in their foot at every turn. Controversy arose when Sly Stone became friendly with The Black Panthers. Adding to the controversy surrounding Sly Stone, was his newfound relationship with The Black Panthers. This was said to be affecting the band’s music. They wanted the band’s music to be more militant, both in style, lyrically and musically. The Black Panthers also felt that Sly and The Family Stone should reflect the movement’s beliefs. Even more controversial was that The Panthers wanted Sly to fire the two white instrumentalists Greg Errico and Jerry Martini. Their replacements, The Panthers said, should be black musicians. Their final request, was that manager David Kapralik be sacked. Replacing him, should be a black manager who would represent the group. Soon, politics were the least of Sly’s problems. Soon, Sly was involved with gangsters. By now, the Sly Stone story was like a cheap dime novel. He had decided to hire gangsters to manage his affairs, protect him and source him drugs. Other members of the band looked on helplessly. With Sly’s various problems and members of the band being sacked, Sly and The Family Stone were a band in crisis. Adding to this crisis was drummer Greg Errico’s decision to leave the band. This was the backdrop for the recording of new album in 1970 and 1971. Sly and The Family Stone were up against it when recording of There’s A Riot Goin’ On began. Recording of There’s A Riot Goin’ On took place between 1970 and 1971 at the Record Plant, Sausalito. Sly and The Family Stone recorded twelve songs penned by Sly Stone. Eventually, amidst rancor, tension and a haze of drugs, a genre-melting album was recorded. There’s A Riot Goin’ On was a delicious fusion of funk, soul, rock, psychedelia and jazz. Ironically, There’s A Riot Goin’ On wasn’t immediately recognized as a stonewall classic. On its release, There’s A Riot Goin’ On was released to widespread critical acclaim. It reached number one on the US Billboard 200 and US R&B charts and was certified platinum. There’s A Riot Goin’ On also featured the number one single Family Affair, which reached number one on the US Billboard 100 and US R&B charts. Sly and The Family Stone, it seemed, could do no wrong. Following up a stonewall classic like There’s A Riot Goin’ On was almost impossible. Especially since Sly Stone was continuing to indulge in the rock ’n’ roll lifestyle. His drug use was affecting the band. He had written and produced the eleven tracks that became Fresh. However, constantly Sly rerecorded and remixed the album. Sly was never happy with the songs. For his record company, this was frustrating. They desperately needed a new album. Eventually, nineteen months after the release of There’s A Riot Goin’ On was released, Fresh was released on June 30th 1973. Reviews of Fresh were mixed. Fresh’s dark, funky sound divided the opinion of critics. Their reviews ranged from favourable to positive. However, other musicians saw Fresh as an innovative album. This included Brian Eno, Miles Davis and George Clinton. Brian Eno remarked that Fresh was the start of a period where the bass and bass drum became the most important instruments in a mix. Miles Davis and George Clinton were equally impressed, referring to Fresh as one of their favourite albums. However, would record buyers agree? To an extent they did. Fresh reached number seven in the US Billboard 200 and number one in the US R&B charts. This resulted in a gold disc for Sly and The Family Stone. While many musicians would’ve been pleased with this, album sales were way down. Was this the end of Sly and The Family Stone’s golden era? Having spent nineteen months recording Fresh, Sly and The Family Stone released Small Talk in July 1974. He wrote ten of the eleven tracks and cowrote Small Small Talk. Sly also arranged and produced Small Talk, which marked the end of an era. Prior to its release, Small Talk received mixed reviews. Just like Fresh, they ranged from poor to positive. Many were wondering had Sly Stone lost his Midas Touch? That proved not to be the case. Small Talk reached number fifteen in the US Billboard 200 charts, and was certified gold. While this should’ve pleased everyone at Epic Records, they were in for a shock. Six months later, in January 1975, Sly and The Family Stone split-up. Between 1969s Stand and 1974s Small Talk, Sly and The Family Stone could do no wrong. They released five albums, which sold over ten million copies. This run of commercial success and critical acclaim began with Stand, which was certified platinum, and ended with Small Talk, which was certified gold. In between, Sly and The Family Stone were one of the most groundbreaking groups of the late sixties and early seventies. Their music influenced several generations of musicians, and much of it is timeless. However, the commercial success and critical acclaim that Sly and The Family Stone enjoyed could’ve, and should’ve lasted longer. Especially given the combined talents of Sly and The Family Stone, that’s hugely disappointing. At the heart of Sly and The Family Stone’s downfall, were the problems surrounding Sly Stone, the group’s leader, songwriter and producer. They eventually took their toll. Just like Icarus, Sly Stone flew to close to the sun. Drugs and his involvement with gangsters and the Black Panthers proved costly. So did his decision to replace key members of the band. By then, Sly’s life had become increasingly chaotic. However, for five years Sly and The Family Stone were an innovative and imaginative band who released groundbreaking, influential music. This journey began at The Fillmore East on the 4th and 5th October 1968, and saw Sly and The Family Stone rise, like a phoenix from the ashes on Live At The Fillmore East-October 4th and 5th 1968. ← PAT THOMAS AND KWASHIBU AREA BAND-PAT THOMAS AND KWASHIBU AREA BAND.